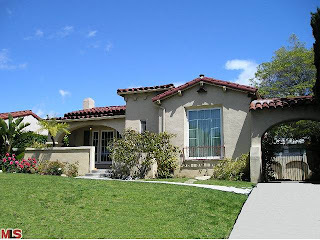 The Westwood Spanish at 1556 Midvale Ave., LA CA 90024 is new on the market with an asking price of $949,000. According to the MLS, the home is a 3 bedroom / 1.75 bath, 1,751 sq ft of living space on a 6,750 sq ft lot. Walking through this house, it looks to be mostly in original condition and needs work/updating throughout. But even thought it needs work and would be classified as a fixer, I think this is a good deal for this house if it sells near this asking price. A recent comp, right across the street at 1527 Midvale, sold for $1,110,000 on 3/17/10. That house was only about ~200 hundred sq ft larger in the house and ~300 sq ft larger on the lot. The condition was slightly better as well, but was not a current update. Something also to consider being on the east side of Midvale is commercial property from Westwood Blvd is in your backyard. And this house at 1556 Midvale has a 3 story office building behind the property. Planting/growing some trees/landscaping could be a solution to help alleviate any privacy issues in the backyard. Don't expect this one to last too long.